Ryan Williams is working his way back from a Career Near-Death Experience. See what WR Greg Childs was like before his. The Career Near-Death Experience. This is one of my favorite Bloomisms of football writing. A Bloomism is what I call the slang that Footballguys and Bleacher Report Draft Analyst Sigmund Bloom (who is also a medalist in some Writer-Olympiad) creates to encompass various football experiences, states of mind, or rights of passage in the sport. The Career Near-Death Experience is an event where a player faces his career mortality. All players face it at some point. Those that don’t cross to the other side discover a new and better way to approach the game. Former wide receiver Cris Carter had a career near-death experience as drug addict when playing with the Philadelphia Eagles and Coach Buddy Ryan helped save the receiver with a southern fried reprise of the ghost of Christmas Future. The career near-death experience can also manifest in the form of competition for a starting role. Chris Wells might have had his career near-death experience last spring when the Cardinals drafted Ryan Williams. Wells had his best NFL season and played hurt – showing grit that most believed he lacked. Now it is Williams who is trying to turn back from his own career near-death after suffering a torn patella tendon. The first play is a stop-and-go route that ends with Childs falling to earth after tripping over the cornerback’s feet. It doesn’t sound like a praise-worthy play, but it is. This play is a 1st and 10 pass from a 22-personne, 1×1 receiver set with 12:22 in the half. Childs runs a failed stop-and-go. 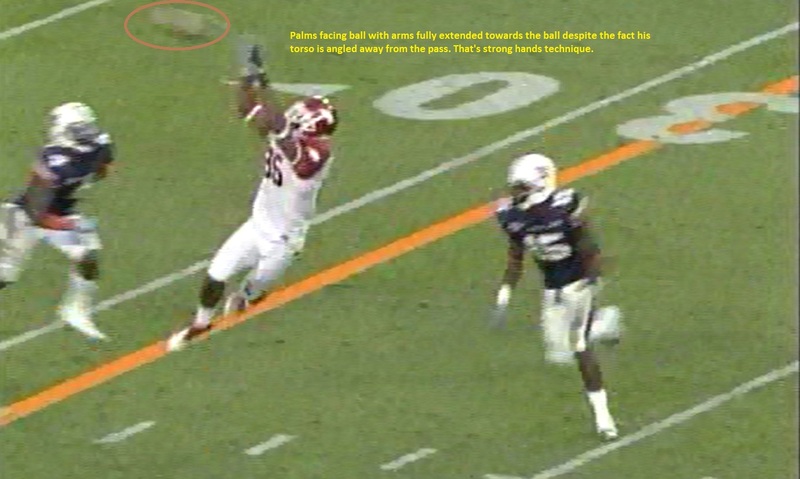 What I love about this failed route his how precise the Arkansas runs the first half of the route. Good explosion off the line. 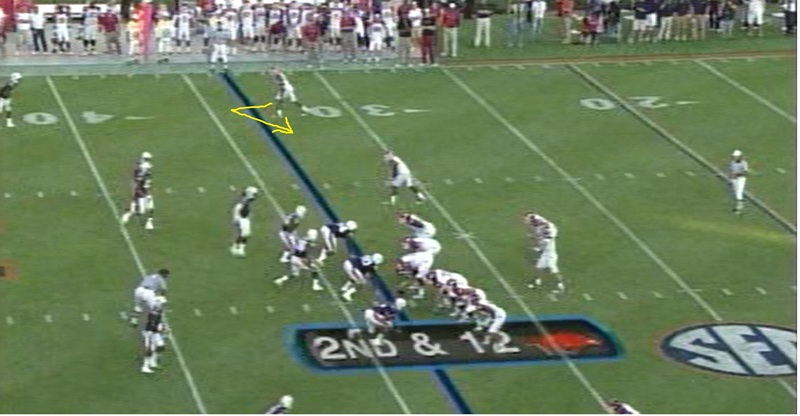 Childs had a CB playing six yards off him at the far side of the field and the Arkansas receiver sells the first half of the route as well as any double move I’ve seen in quite some time. The first half of the route is a hook route. Most receivers will hint at a break, few will actually make one and then act out a reception. This is what we’re about to see from Childs, who comes off the line with good explosion to lead the CB to believe he’s going to run a deep route, which is what a receiver wants a defender to believe when he drives hard off the line. Childs begins his break to set up the double move. This fine job of sinking the hips and executing the beginning of a hard break is where most good receivers begin and end the route. Not Childs. 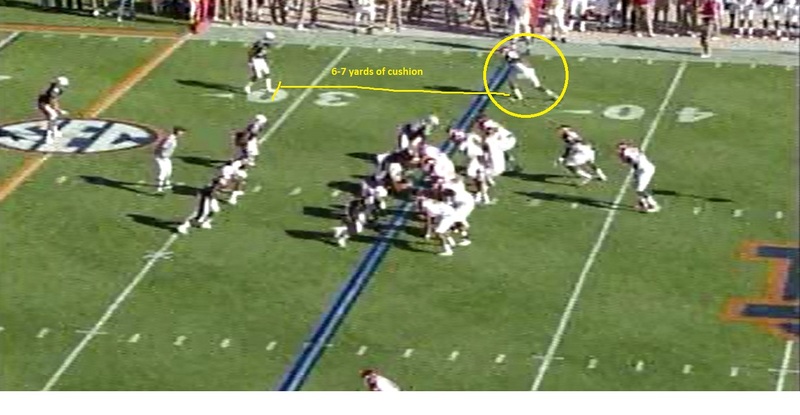 Childs’ strong hook with a good plant and turn forces the CB – who has already turned his hips down field to begin to run with Childs after the receiver’s strong initial burst off the line – to react to the hook route. But Childs takes this double move a step further than most. He acts out the break back to the ball. 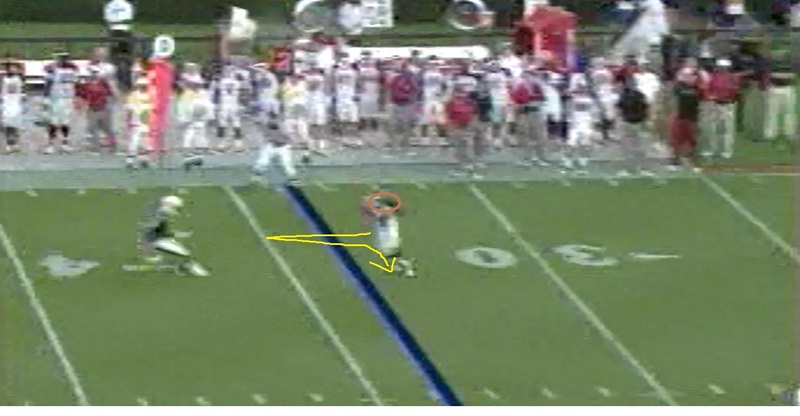 With his hands out and veering towards the sideline back to the ball, Childs runs the full hook route. Rare for a double move. 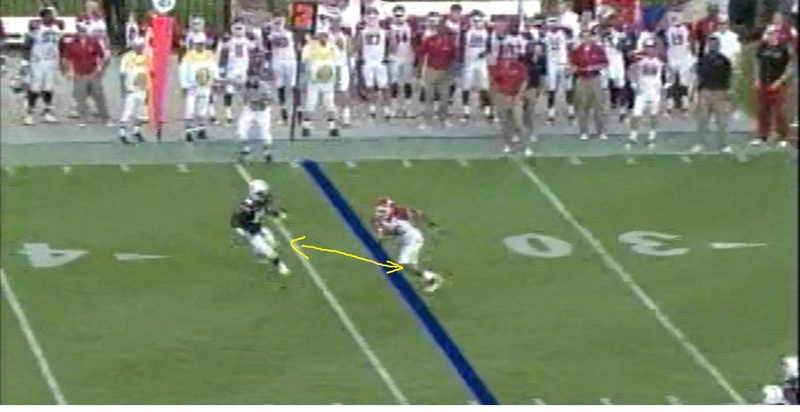 And it’s a good hook route – uncommon for a college receiver. Childs then does a masterful job of acting out his attempt to break towards the QB with an extra shuffle towards the passer. 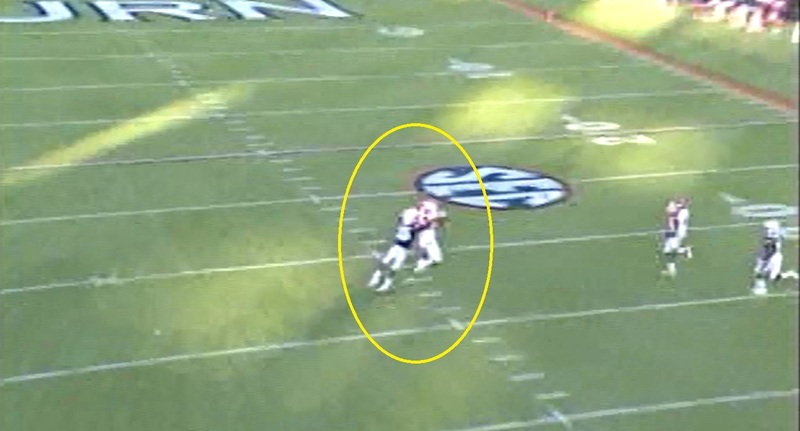 However, what Childs doesn’t anticipate is the CB breaking as close to the receiver as he does. Childs’ extra step towards the QB puts him in a position where he turns outside and trips over the CB’s outstretched foot. 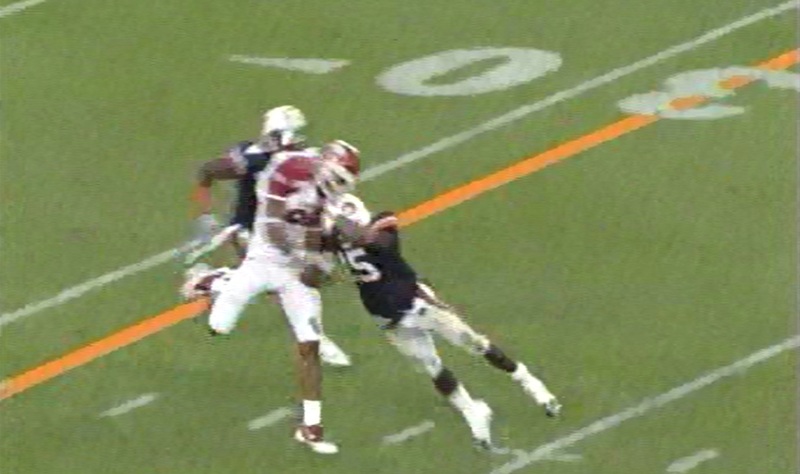 This is rightfully ruled incidental contact. 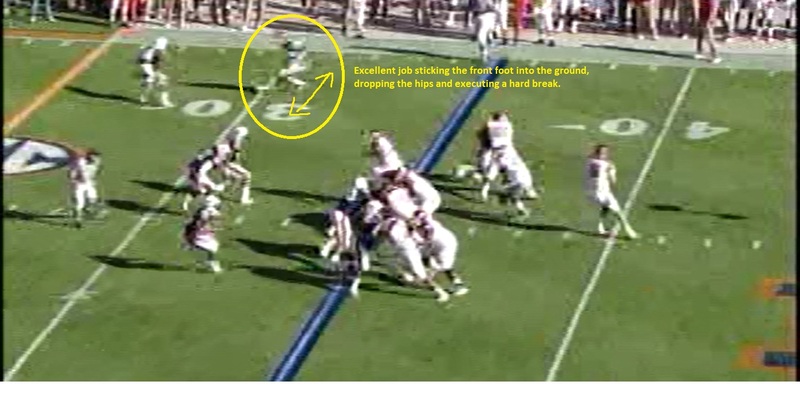 Although end result did not match the effort, Childs’ fundamentals on hard breaks and selling a route were apparent on this play. Childs’ third catch is a 54-yard reception on 1st and 10 with 4:10 in the third quarter from a 12-personnel, 1×1 receiver set. 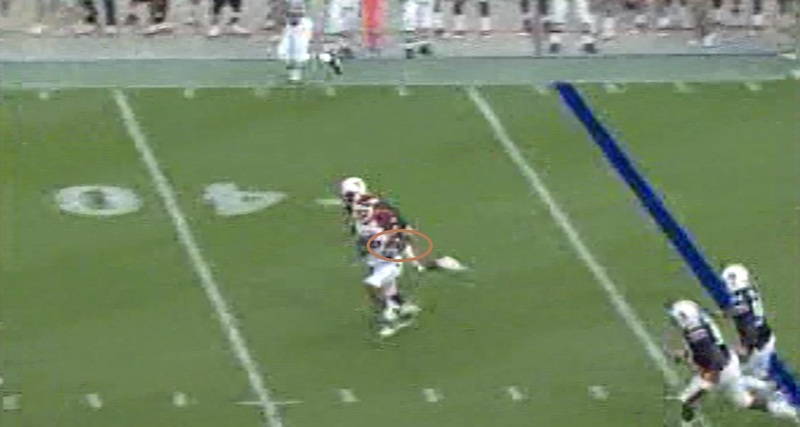 Childs is the X receiver lined at the bottom of the screen just outside the left hash. 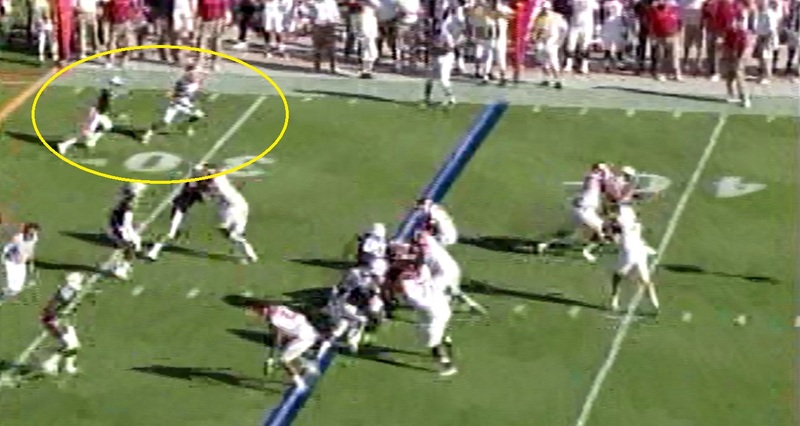 Auburn plays a 4-3 and Childs runs a deep cross while the QB and RB execute a flea-flicker. 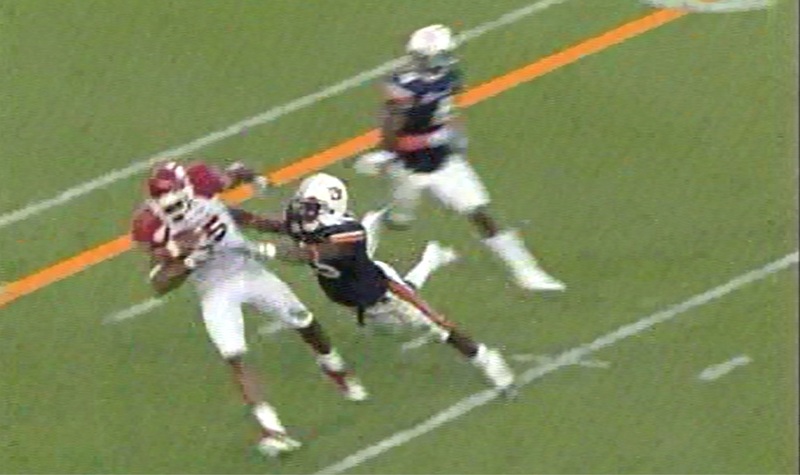 Although much of the Auburn front bites on the elaborate play fake, the CB covering Childs does not. He remains stride-for-stride and tight to the WR’s back as the ball arrives. 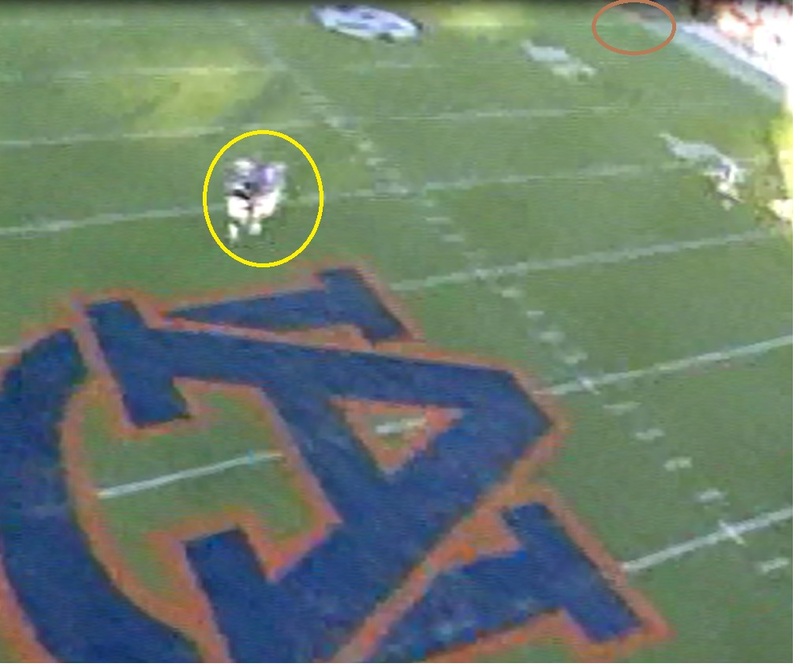 Childs has to slow his gait to turn back to the high-arcing pass that allows the Auburn CB to maintain his position tight to the receiver. This is going to be a tight-quarters catch. 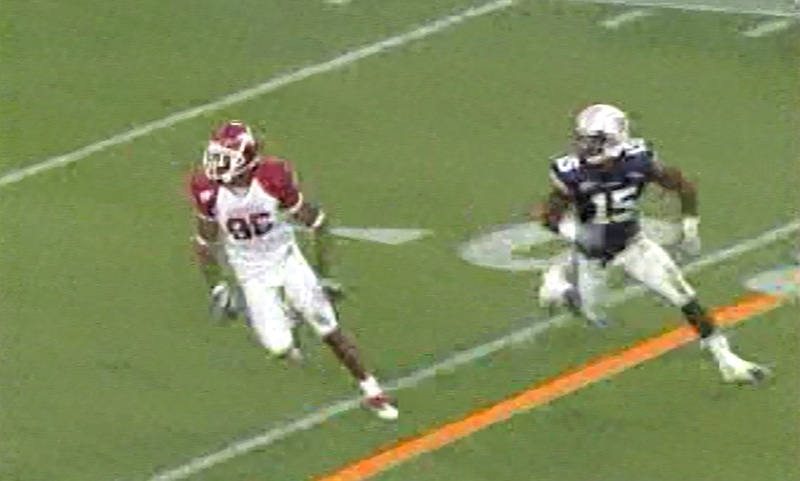 Childs turns his shoulders back to the ball while on the run and he extends his arms for the ball, making the catch with his hands while the defender is wrapped around the receiver’s back and arms. 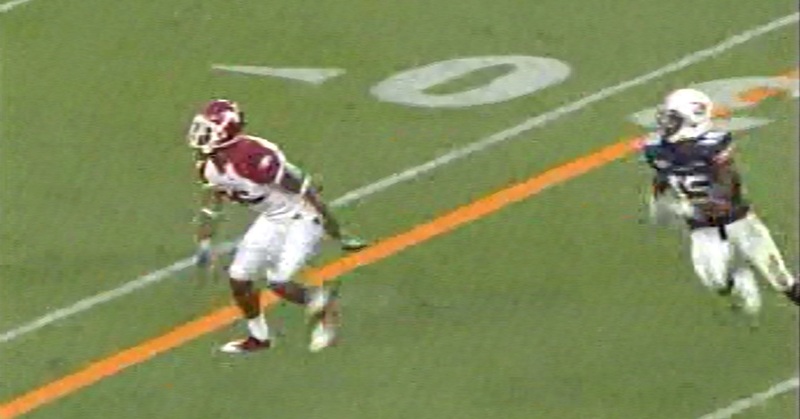 You may not see the catch, but you can clearly see the defender wrapped around Childs as he makes the play. Good concentration on a down field route where he has to track the ball at a full gallop. The catch is a 40-yard reception with momentum taking Childs and the CB another 14 yards. These are the kind of tight-quarters plays that are common in the NFL deep passing game. Childs gains 13 yards on a 2nd and 12 reception with 0:59 in the third quarter from a 2×1, 11-personnel shotgun set. The pass is a throw-out to Childs on a one-step hitch. This is a one-yard hitch. It may seem like overkill to execute a one-yard hitch with the same precision as a six-yard hook, but it’s this attention to detail that makes great players. It’s part of the reason why superstars are at the right place at the right time. Childs not only catches the ball with is hands away from his chest while facing the QB at the numbers of the line of scrimmage but he also works his way to the ball. This extra step towards the ball is about to help Childs earn another 13 yards and a first down on 2nd and 12. Little things matter. This may seem meaningless to the casual observer, but that extra move helps Childs generate the momentum necessary as a runner to beat the CB to the inside. He turns inside the CB in the flat and accelerates past him while switching the ball to his inside arm to keep it away from that CB’s pursuit. That one step creates a good diagonal angle the amounts to a lot more separation than you’d think. It’s a game of inches, right? Childs now switches the ball to his inside arm because of the CB pursuing from the outside. Good thinking. 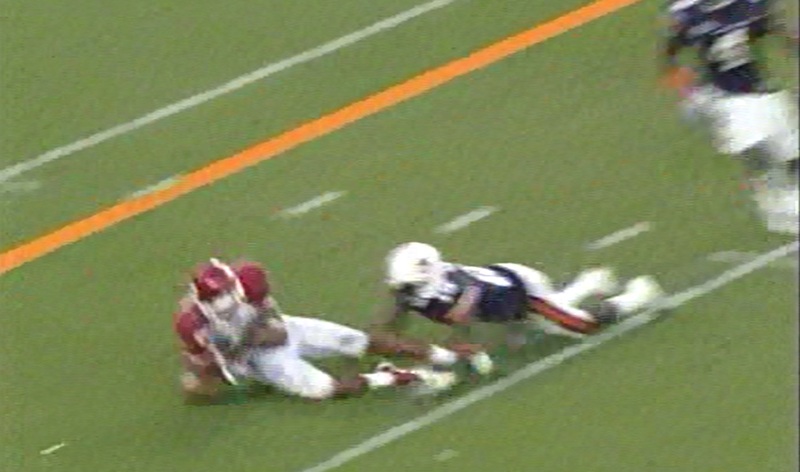 Childs gains eight yards and then does a fantastic job of preparing to meet the Auburn safety head-on with terrific pad level. 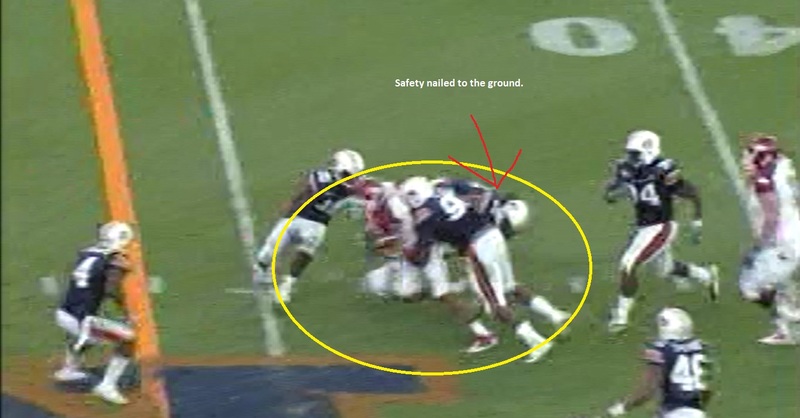 The old football axiom says “low man wins,” but there is an exception to that rule and that’s when the hammer (Childs’s pads thrusting downward) meets the nail (the Auburn safety in a prone position). Childs runs through the hit, keeps his legs moving, and falls forward another four yards when Nick Fairely wraps the receiver from behind. Childs finishes the play extending the ball beyond the first down marker. Childs runs through the safety and his pad level helps him generate extra yardage after DT Nick Fairley wraps from behind. Childs falls across the orange line for the first down. Excellent pad level, physical finish and leg drive. 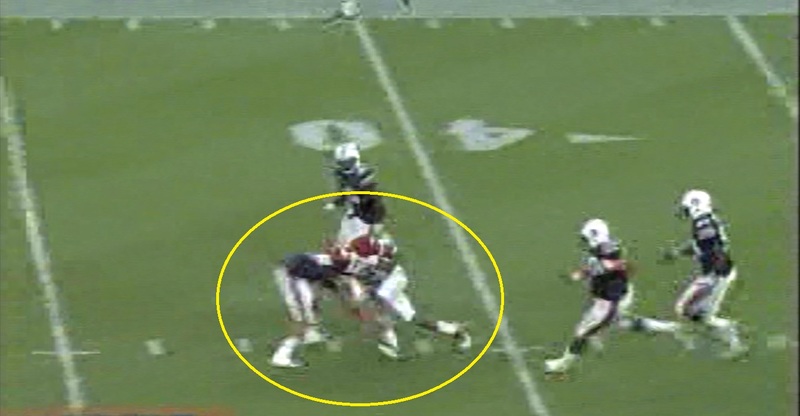 Nick Fairley’s hit in the back drove him forward, but still it was a good effort. Childs’ next target is another 13-yard gain with 11:44 left on 1st and 10 from a 2×1 receiver, 11-personnel pistol. 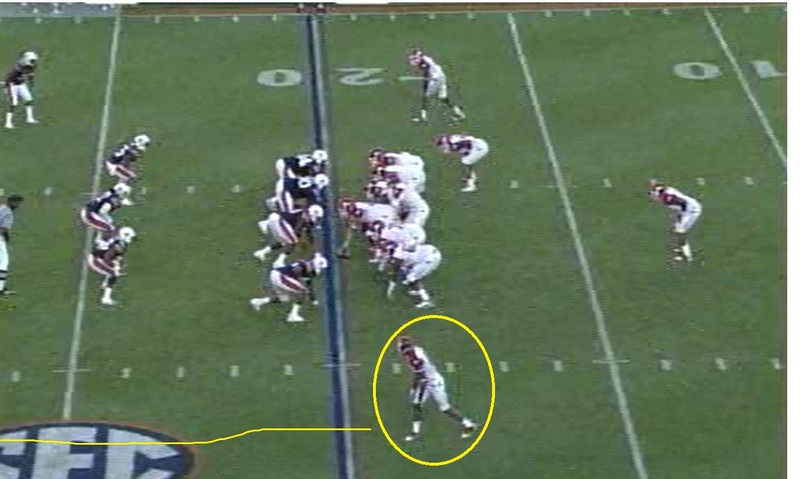 This 1st and 10 crossing route is targeted with Auburn blitzing from the slot. Childs runs a 13-yard cross from the outside spot of the twins side at the numbers. He has to make a diving adjustment on the ball thrown over his head with the CB behind him and over top. 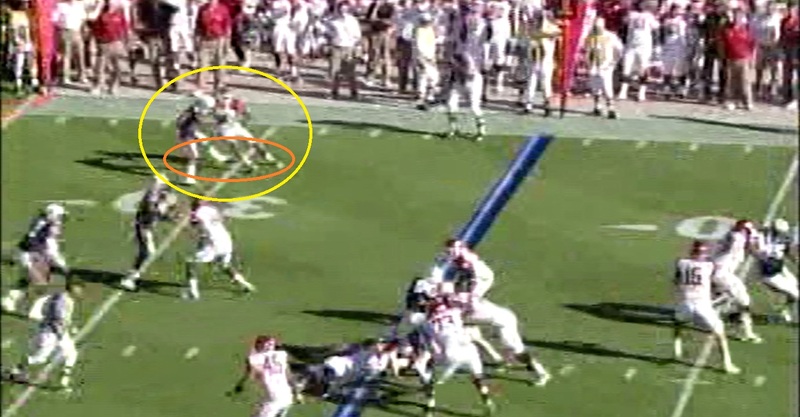 Childs route begins like most crossers, but the blitz is going to forces an errant throw. Instead of running through the pass, Childs must now adjust to the ball with the knowledge that he has a defender looming over top. Childs makes a grab with strong technique as described in the photo (click to see magnified version). This catch versus contact is about strong hands, concentration, will, and courage. Even in the face of a violent, split-second confrontation, Childs has the presence of mind to tuck the ball in the arm away from the defender’s reach. Childs then covers the ball with his free arm to insure it doesn’t come loose. If this is the old form we should expect from Greg Childs after an impressive Pro Day, his career resurrection will be a bargain for a discerning NFL team. Another wonderful piece. Makes me want to wait on receivers instead of fighting for the top talent. But one question, through out your articles you mention 11 personnel and 22 personnel, what do they mean? Thanks for writing. “Personnel” is short hand for the type of players you have on the field. The first digit is the number of running backs on the field. The second is the number of tight ends. 01 personnel = no backs, 1 tight end. 20 personnel = 2 backs, no tight end. 23 personnel = 2 backs, 3 tight ends. empty = no backs, no tight ends (five wide receivers). 11 personnel = 1 back, 1 tight end. 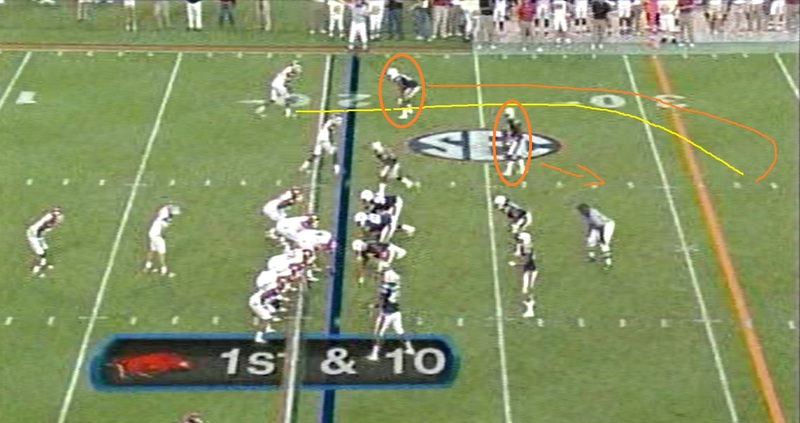 So when say Childs is at the far side of an 11 personnel, 1×2 receiver shotgun set what I’m telling you is that the Arkansas offense is playing in a formation where there’s 1 RB, 1 TE, and three receivers. The 1×2 means there’s 1 receiver at the far side of the field (from our viewing vantage point) and two receivers at the near side. Yes that helps a lot! Now I can enjoy all other articles even more.